Tesla finds itself in a peculiar situation now that the mass media is jumping all over the three recent Model S fires. The company and its outspoken founder know that the car is sound, and that there is no technical reason why a Tesla would burn up any more often than, say an Audi RS 7, its closest competitor. However, as Audi knows all too well, it does not matter one whit if those accusing you of a problem have the facts on their side when it comes to the world of automobile defects, crashes, and bad behavior. There was never anything wrong with the Audis that accelerated into things. At the time Audi’s did not do that more often than other cars sold in the US. In the end it didn’t matter, once the issue “went viral” Audi could not contain the fallout and it cost the company big time. In my opinion, the same is now true for Toyota. I have never read anything to convince me that Toyotas had a higher incidence of unintended acceleration than other automakers’ vehicles did. That does not really matter. All that matters is that the public thinks they did. No amount of technical proof is going to change anything. Once the legal eagles get a whiff of a settlement they will jump on it, find a location that is favorable for them, and they will put a dozen Americans in a jury box if necessary. They have nothing to lose. The automaker has everything to lose, so they will settle. Then apologize for whatever the public wants it to. 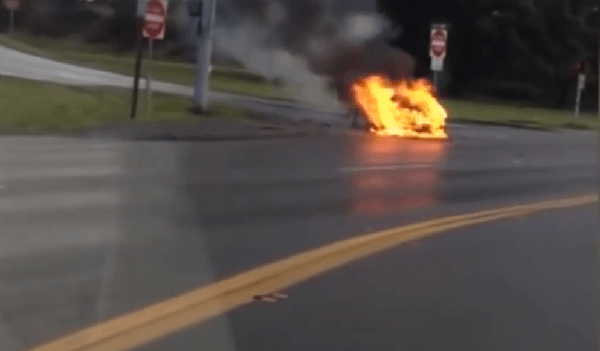 The Tesla Model S is made from things that are combustible. A terrible manager I once worked for (who was fired) used to tell everyone he met, in any possible situation, that a fire only needs three things; A combustible material, oxygen, and an ignition source. A Tesla Model S in a parking lot or in a crash has all of those things. So do all cars. A car company that sells $100K plus vehicles that it says “are the best cars in the world” looks very silly when the media shows pictures of that car on fire even though it is a rare event. When the founder is bold enough to say something like “you are 5 times more likely to experience a fire in a conventional gasoline car than a Tesla!" he thinks he is being smart. However, after two more fires in the same month, all the Tesla bashers start doing math. The Tesla Blog is now full of people using high school math to try to prove Mr. Musk’s statement is right or wrong. They are all missing the point. It does not matter. Sadly, all that matters is perception. If you really want to try to find out if Teslas are burning up due to something inherent to their design, feel free to read the stories being written in all the mass media outlets. None of those writers are educated as engineers (as this writer is). It is fun to see them try to piece together what facts they can glean to try to prove a technical point. That isn’t how failure analysis works. Again, let’s you and I keep watch on the big picture. The only real threat to Tesla is not its design, which could easily be modified. The threat is perception. Right now the story is trending that the fires are being caused by Teslas hitting things. Any car can catch fire from crashing into things and then suffering so much damage that a fire starts. The Teslas are not catching fire in people's garages, or while parked in lots like the Fiskers were. Tesla is now being treated the same way that all automakers are. There are two sides to this story, but all that will matter is which side is more exciting to readers. Whenever there is a slow news day, and great photo, Tesla will be bashed by the same media outlets that re-write its glowing press releases. Mass media outlets, and jury pools, with no engineering perspective are a double edged sword. Finally, someone has written the true problem for Tesla. It is a brand problem not a technical problem. Brand problems are interestingly more expensive and harder to solve. Good post! Thanks Tim. We appreciate the feedback.